OUECT’s 3Q18 DPU of 0.55 Scts down 11% y-o-y, in line with expectations after adjusting for recent rights issue. Negative drag from lower occupancies and higher borrowing costs following redemption of CPPUs. Weak FY18F DPU due to extra shares from rights issue and only a 2-month contribution from OUE Downtown. Leveraged to Singapore office market upturn but potential dilution CPPU conversion casts a shadow. We maintain our HOLD call on OUE Commercial REIT (OUECT) with a revised Target Price of S$0.47. While we see long-term value in OUECT as it trades at c.15% discount to its book value and spot office rents in Singapore have started to recover, we believe the stock will trade range-bound in the near term given the disappointment over the impact to DPU from the recent rights issue, headwinds from the loss of income support in FY19 and impact from the depreciation of RMB. While we and consensus both have HOLD recommendations on OUECT, our target price is lower than the consensus average, as we believe the loss of income support in FY19, and overhang from the potential dilution from the conversion of the convertible perpetual preferred units (CPPU) in the medium term would likely result in OUECT trading below book. This is despite the quality of OUECT’s buildings which are in the Grade A category and/or in prime locations. In addition, clarity over its capital structure, in particular how it intends to mitigate the potential medium-term dilution from the CPPUs may lead us to be more positive. After incorporating the impact from the recent rights issue, we lowered our Target Price to S$0.47 from S$0.67. OUECT’s 3Q18 DPU came in at 0.55 Scts which was down 11% y-o-y after adjusting for the additional shares on issue from the recent rights issue. Using the rights adjustment factor, 3Q18 DPU would have fallen by 46% y-o-y. Excluding the impact of the rights issue, 9M18 DPU would have formed c.74% of our original FY18 DPU. The weakness in underlying DPU is attributed to lower portfolio occupancy (94.9% versus 97.0%) and the consequence of prior quarters of negative rental reversions. These factors also resulted in 3Q18 revenue and NPI both falling 5% y-o-y to S$41.2m and S$32.3m respectively. Furthermore, DPU was negatively impacted by higher interest expense as OUECT had earlier redeemed c.S$175m worth of convertible perpetual preferred units (CPPU) which pays a 1% p.a. coupon that was funded with debt. Although overall portfolio occupancy remains healthy at 94.9%, it was down from 97.0% in 3Q17 and 95.2% in 2Q18. The y-o-y decline is due to marginal decline in occupancy in the office components at OUE Bayfront (97.6% vs 98.2% in 3Q17) and One Raffles Place (96.2% vs 97.3% in 3Q17). For Lippo Plaza, office occupancy fell to 94.2% from 100% in 3Q17 as an increase in new office supply in Shanghai has made the market more competitive. Meanwhile, while committed occupancy at retail component at One Raffles Place is up to 98.5% from 85.7%, we understand physical occupancy is tracking around 90% level. OUE Bayfront achieved positive rental reversions with committed rents achieved during the quarter ranging from S$10.70-12.80 psf/mth as compared to average expiring rents of S$10.67 psf/mth. Lippo Plaza also reported positive rental reversions on average. Signing rents ranged between RMB9.00- 11.00 psm/day versus average expiring rents at RMB9.28 psm/day. Meanwhile rental reversions were flat on average at One Raffles Place, with signing rents of S$9.70-11.50 psf/mth compared to average expiring rents of S$10.39 psf/mth. Following renewals achieved over the quarter, only 3.5% of leases by gross rental income are due to expire for the remainder of FY18, down from 8.4% at end 2Q18. On an asset level, OUE Bayfront does not have any leases due for the remainder of FY18, while 6.2% and 2.1% of leases are set to expire for One Raffles Places and Lippo Plaza respectively. In FY19 and FY20, 23.9% and 24.8% of leases are set to be renewed for OUECT’s overall portfolio respectively which provides an opportunity for the trust to raise rents in Singapore given an expected increase in market rents. OUECT’s gearing as at 30 September 2018, stood at 41.4% marginally up from 40.3% at end 2Q18, due to impact of a depreciating RMB. However, post the completion of OUE Downtown in November, gearing is expected to fall to around 40%. The depreciation of the RMB and payment of 1H18 DPU also resulted in NAV per unit falling to S$0.89 from S$0.92 in the preceding quarter. Post the rights issue, we estimate NAV per unit to settle around S$0.69-0.70. After incorporating the recent S$908m acquisition of OUE Downtown on an 5% NPI yield and S$588m rights issue (83 rights units for every 100 existing units with a rights price of S$0.456 per share), we lowered our FY18/19/20F DPU by 43/22/24% respectively. The larger decline in FY18F DPU is due to the full impact of the additional shares from the rights issue but only two months of contribution from OUE Downtown. We have also lowered our DCF-based Target Price to S$0.47 from S$0.67 previously after accounting for the additional rights units. In addition, we have assumed a higher cost of debt of 4.5% from 4.0% previously, in line with DBS’ economists more hawkish interest rate outlook. Heading into FY19, we expect a strong recovery (+38% y-o-y) in DPU due to the full year contribution from the OUE Downtown acquisition and tailwinds from an upturn in the Singapore office market, partially tempered by increase in interest rates. However, we believe OUECT’s share price performance will be muted due to disappointment associated with the impact on DPU in FY18 due to the rights issue and potential conversion of the outstanding CPPUs (additional 18% units). There are currently S$375m worth of CPPUs with a conversion price of S$0.7154. 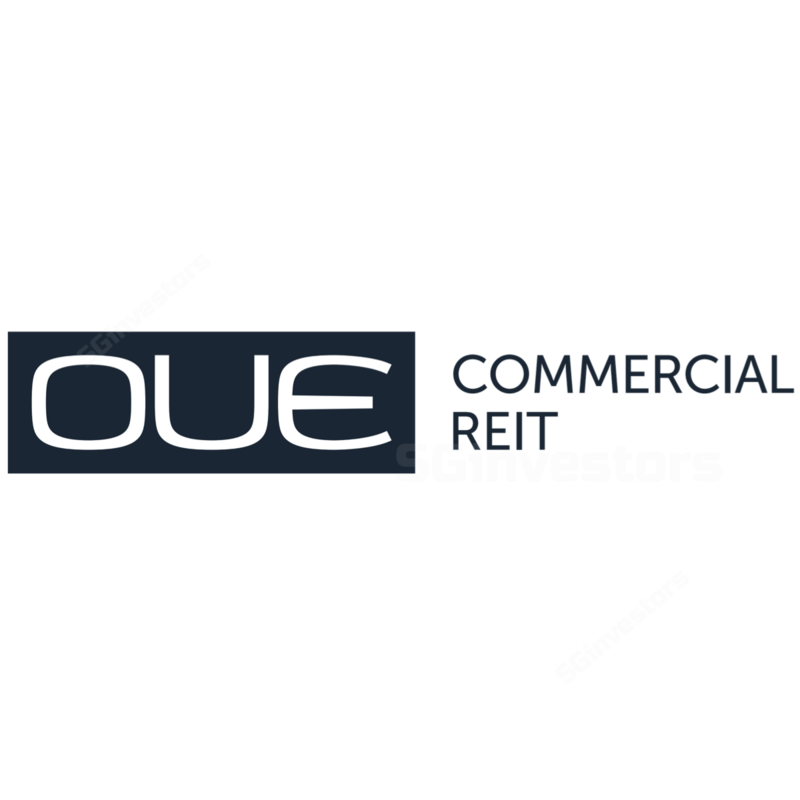 The CPPU’s are owned by OUECT’s Sponsor, OUE Limited (SGX:LJ3). OUE Limited has the right to convert the CPPU into OUECT’s units from October 2018 onwards. However, no more than one third of the total number of CPPUs initially issued can be converted in any financial year (equivalent to S$183m worth of CPPUs). With limited upside to our revised Target Price of S$0.47, we maintain our HOLD call.